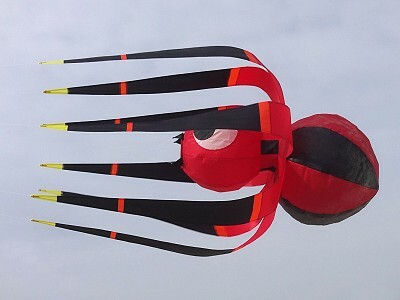 Cobra Kites does design work and custom projects ranging from large one-off pieces to runs of unique kites. We have designed and made large inflatables as well as kites purely for display. 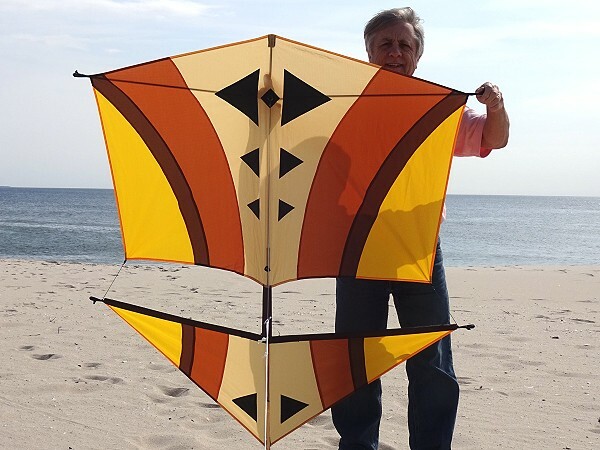 We encourage you to contact us by telephone 732 270-2112 or e-mail info@cobrakites.com to inquire about your project. 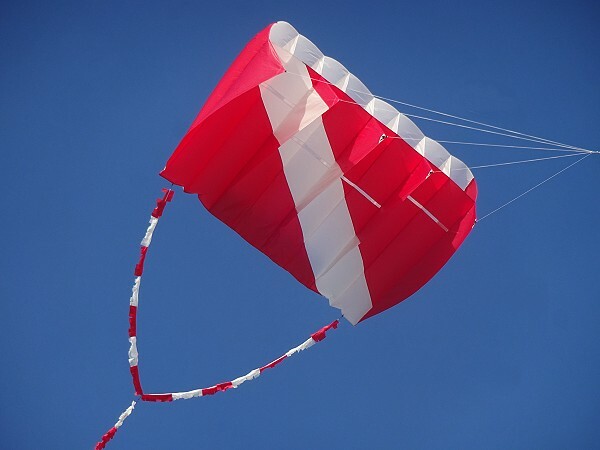 We are able to produce unique kite projects in-house as well as create designs from initial concept. 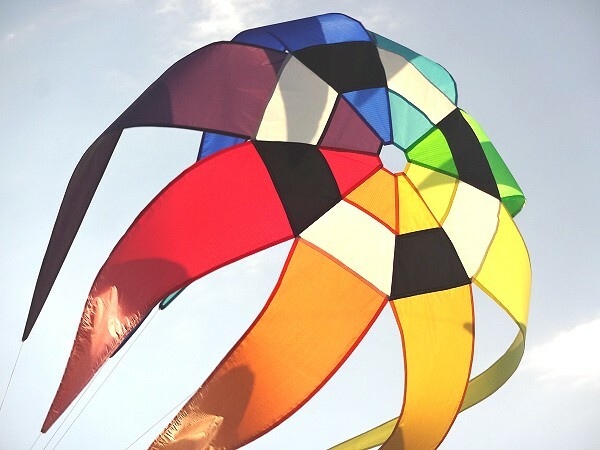 Projects range from single large kites and inflatables, design for third party large run production, gallery quality show pieces, kites for advertising, custom kites for discerning kite fliers, special purpose kites and more. Custom UltraFoil 45 ram-air aerofoil with applique parachuting bear logo. Made for avid Teddy Bear dropper to lift multiple sky-diving Teddy Bears aloft. 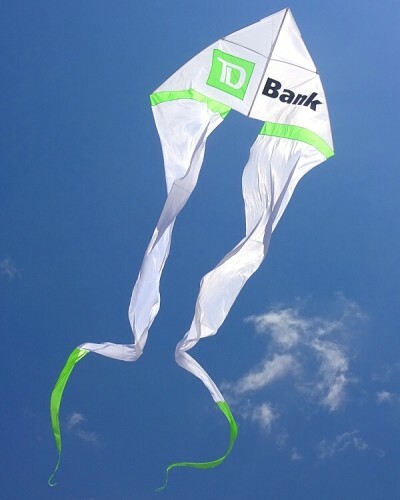 One of 3 kites requested to cover a wide wind range. 45 square feet. Custom UltraFoil 60 ram-air aerofoil with custom applique Banner Tail with parachuting bear logo. Made for avid Teddy Bear dropper to lift multiple sky-diving Teddy Bears aloft. 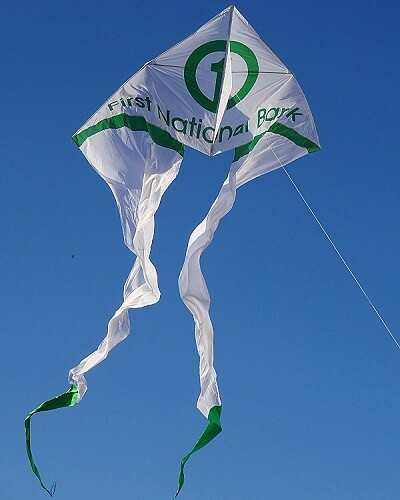 One of 3 kites requested to cover a wide wind range. 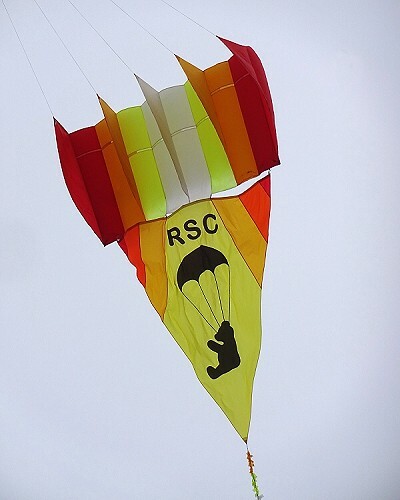 The short full kite width Banner Tail was commissioned to add the logo to a previously made 4 color UltraFoil 60. 60 square feet. 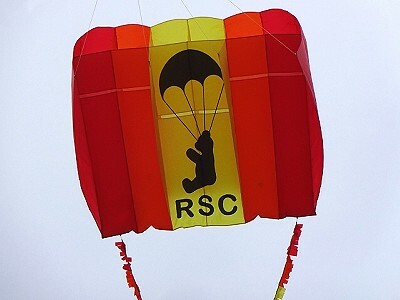 Custom UltraFoil 30 ram-air aerofoil with applique parachuting bear logo. Made for avid Teddy Bear dropper to lift multiple sky-diving Teddy Bears aloft. 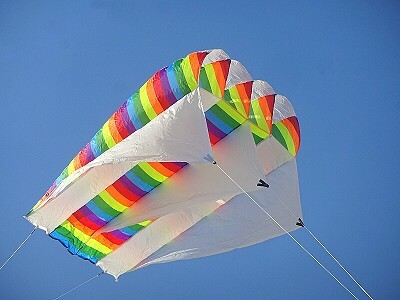 One of 3 kites requested to cover a wide wind range. 30 square feet. 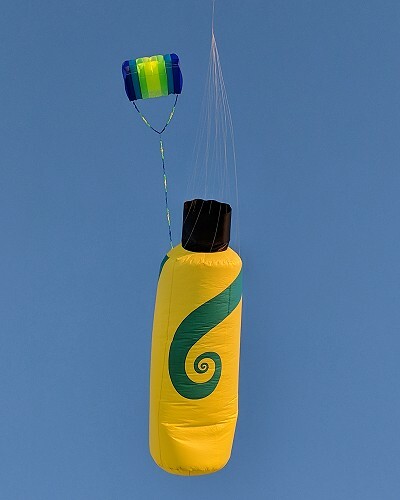 3 ft. diameter x 15 ft. long tube with applique logo for flying kite surfing school marker. 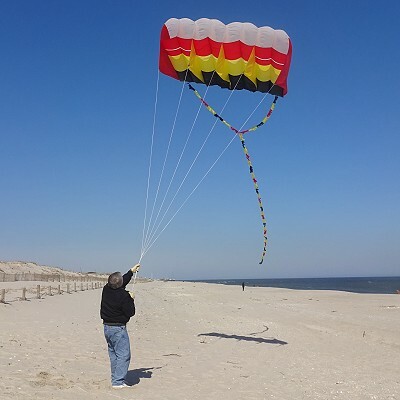 The adjustable vent tube for varying wind conditions is lifted into the air by a 36 square foot Sled kite. Easy to use package with moderate pull which uses 500 lbs. breaking strength flying line. 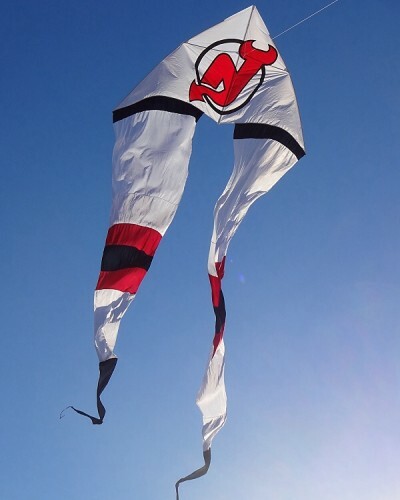 11 ft. wingspan custom New Jersey Devils Ghost Delta made to be flown at sponsored outdoor beach event. 6.5 ft. wingspan custom applique Tri-Tail Delta for company promotion. 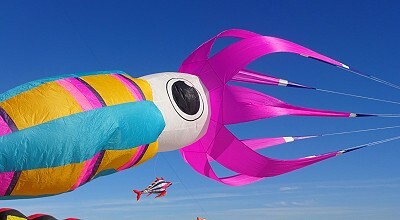 This is a very easy kite to assemble and fly and has great "sky presence". It looks fabulous in flight with its' long flowing tails. Tails can be custom colored to match the main sail graphics. Custom 11ft wingspan Ghost Delta with applique logo and colored tail tips. 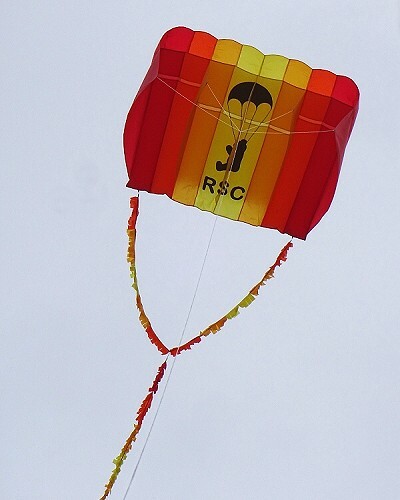 Corporate kite for outdoor event. Custom UltraFoil 15 using client provided die sublimated fabric in construction. Spider "Line Laundry" designed for production by prominent kite manufacturer. 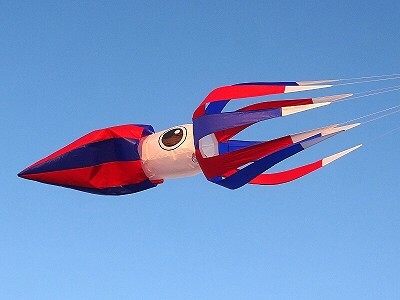 11ft long Squid "Line Laundry" in Red, White & Blue color scheme. Custom made in house. Test flight of UltraFoil 60 for individual customer. Vertical Archimedes Screw rotating spinners. Used on stage as a backdrop for musical performance. Shown in an outside setting driven by the wind, these are to be fan driven when used inside. Rip-Stop Nylon with Fiberglas and Carbon Fiber framing. 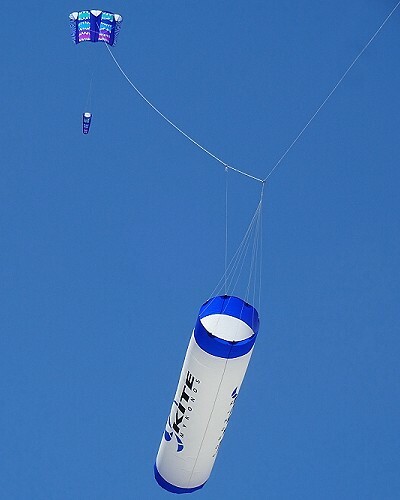 Giant 6ft diameter shampoo bottle "Line Laundry" for promotion test flown on the line below a custom UltraFoil 60. 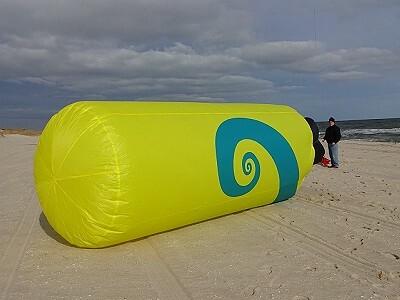 Giant 6ft diameter shampoo bottle "Line Laundry" for promotion to be flown below a customized Power Sled 81. Giant 20ft long Squid "Line Laundry". Smaller version of the 30ft long size in the image at top left of this page. 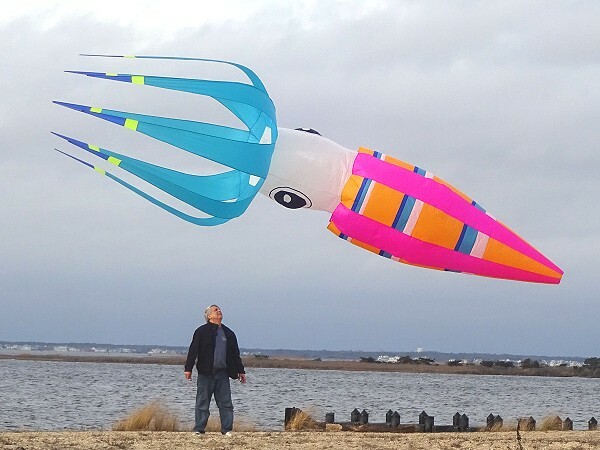 Created after designing a production 11ft long size Squid for prominent kite manufacturer. 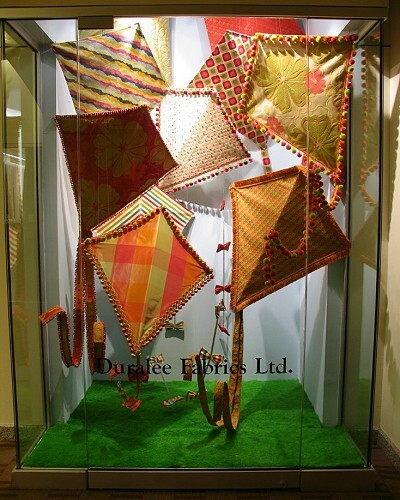 Series of Diamond Kites made from clients Upholstery fabric to display new season range in interior settings. 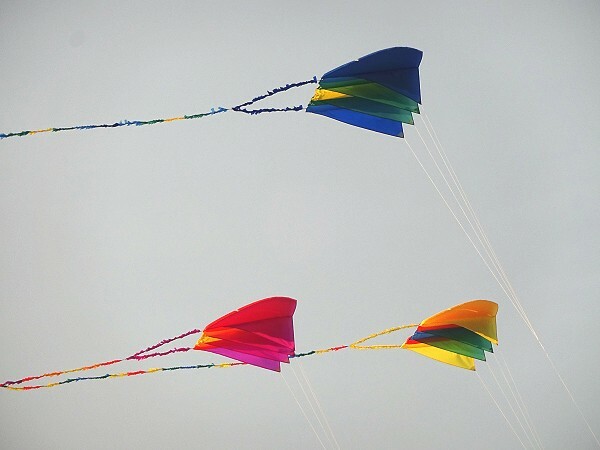 Not intended to fly, these kites needed to look realistic in several display case settings. UltraFoil 30 sq.ft & 15 sq.ft. 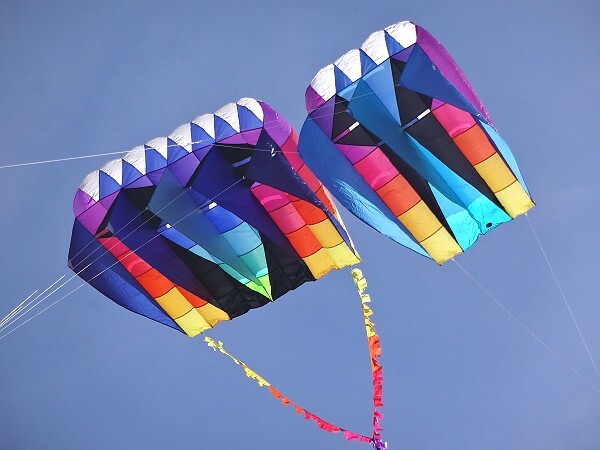 kites for prominent kite manufacturer. Designed, prototype tested, pre-production samples and production sequence and patterns created for large run manufacture. 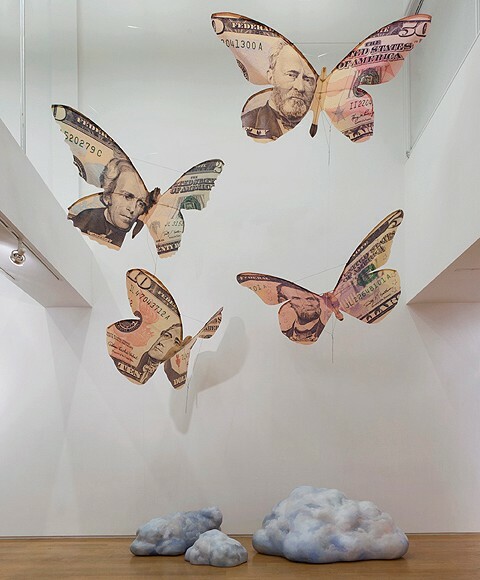 Series of Butterfly kites created for an artist from specially printed US currency fabric. Initially required only for art gallery quality display. Framing and realization of three dimensional pieces from flat drawn concept. The kites we subsequently required to fly for an outdoor performance. 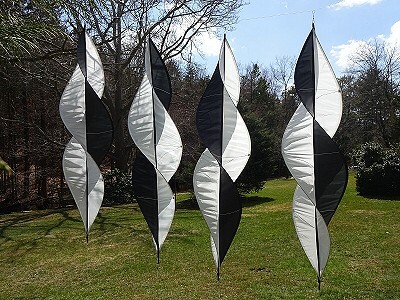 Large gallery quality kite, approximately 20 feet high created for an artist from a drawn concept and specially printed fabric. Artist idea realized into an art gallery display piece which was subsequently engineered to fly. 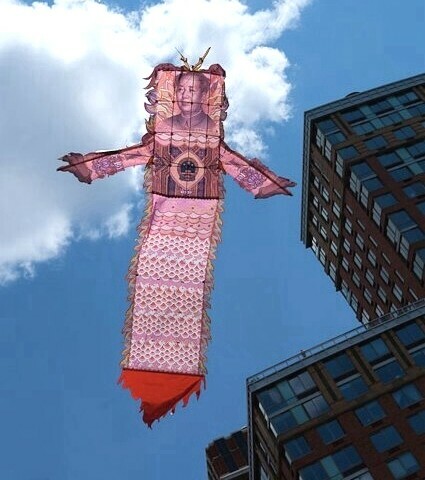 Flown in a New York City location by Cobra Kites for a specific outdoor performance. Production kite customized to give a unique graphic look. 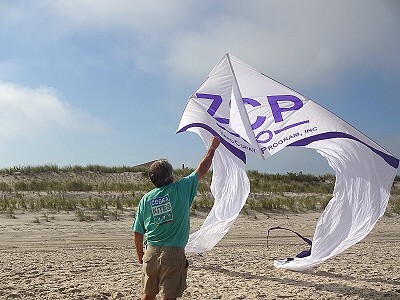 Existing kites can often be customized to create a visual one-off example. 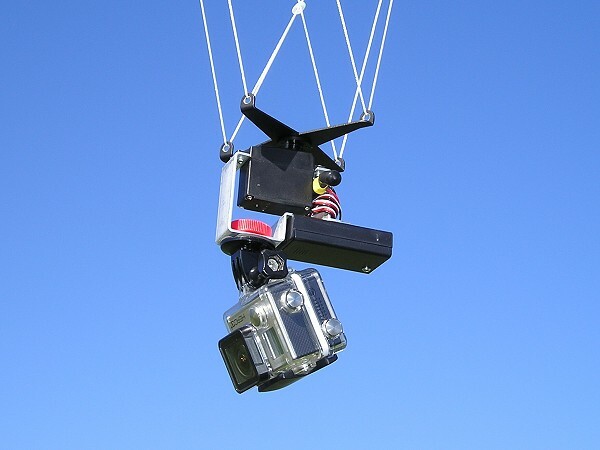 Compact auto Kite Aerial Photograhy (KAP) rig for GoPro camera. Simple solution to loft a GoPro camera on a kite with Picavet suspension system and automatic continuous stepped 360 degree rotation. Specific size UltraFoil kites made from Icarex fabric for NASA project. Rotating "Line Laundry" project. 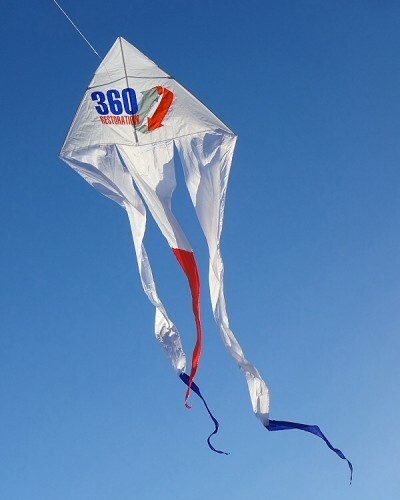 Design adopted by prominent kite manufacturer for production in three sizes. Test flight of an UltraFoil 60 for individual customer. 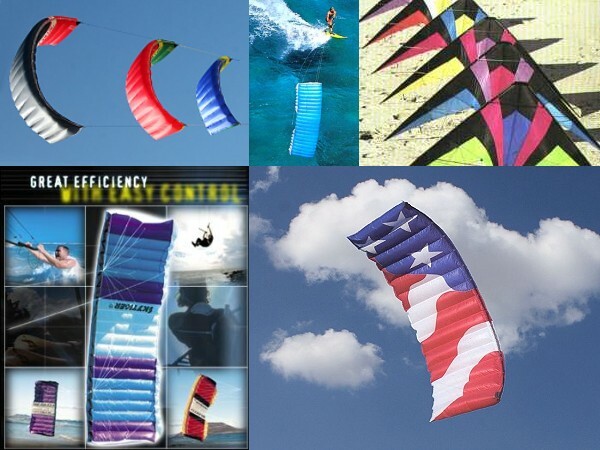 Previous projects designed by Cobra Kites include, FlexiFoil Power Kites, Skytiger Quad-Line Traction Kite, Scorpion 2-Line Stunt Kite & SpeedFoil RM Series. Just a few of many large scale manufacture products.